Draining over 2,500 square miles of land and comprised of eight major sub-basins, the Chehalis River Basin is among the largest watersheds in Washington. In fact, it is second in size only to the Columbia Basin. 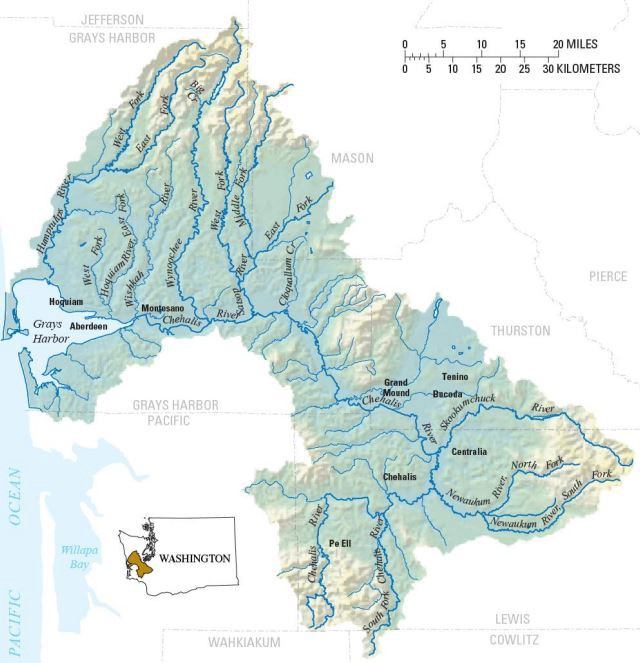 Due to its size, importance, and the diverse demands for water within it, the Chehalis River Basin has been identified as a priority area for protection by the Washington State Department of Natural Resources (DNR). Property owner must own a total of no more than 5,000 forested acres within the state of Washington. Written cost share approval must be issued by DNR before plan is written. Approved landowners whose plans meet the program requirements will be reimbursed for 50 percent of the consulting forester’s fee. Stewardship plans give landowners valuable information, such as current forest health conditions, wildlife habitat enhancement ideas, timber harvest opportunities, and management recommendations to meet your objectives as a forest landowner. Perhaps most importantly, a plan provides a tangible document that serves as a focal point of discussion with other stakeholders in the property, such as heirs, and can stimulate discussion about forest management with friends, family, and neighbors. Additionally, Washington’s Integrated Forest Stewardship Plan helps landowners meet written forest management plan requirements for American Tree Farm System, Natural Resource Conservation Service Environmental Quality Incentives Program, Washington Department of Revenue Designated Forest Land Tax Program (county assessor requirements for obtaining designated forestland land use classification) as well as the DNR Forest Stewardship Program. To apply for this cost-share program contact Matt Provencher at the DNR Small Forest Landowner Office at matt.provencher@dnr.wa.gov or (360) 902-1494. Before we sign off on this edition of Stewardship Notes, I would like to introduce myself, Patrick Shults, as the new Extension Forester for WSU in southwest Washington. A little about myself: I was born and raised in Michigan and received a B.S. and M.S. in Forestry from Michigan State University. 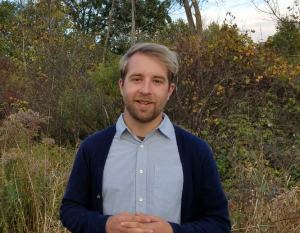 Much of my background has been with environmentally focused non-profits, where I’ve gained experience leading volunteer teams and educating the public in fields like sustainable forestry, urban forestry, and habitat restoration. I also have a history of writing forest management plans for small forest landowners and a strong background in agroforestry and non-timber forest products. I’m very excited to be bringing this experience here to build education programs and assist landowners in this part of the country. Forestry and education are my two greatest passions, which means this is essentially a dream job. I’m looking forward to meeting landowners and making connections as I continue to settle into this role. As a part of my new position, I will also be taking over as the editor of Stewardship Notes (wishing Carol Mack a happy retirement!). As I get accustomed to the area and the many issues facing small forest landowners I will be keeping in mind the opportunity to address these concerns through Stewardship Notes. In particular, I hope to highlight the landowner perspective by inviting your submissions for future editions of SN. This could be in the form of a personal narrative about you and your land, you can send your forest management questions and I will have them answered in the next edition, or maybe you just want to share something you find interesting with the small forest landowner community. Since landowners are the target audience for this newsletter, I think a great way to have your concerns and interests recognized is to have you submit them, so don’t be shy! Please send your submissions to patrick.shults@wsu.edu and feel free to contact me with any questions via email or phone at (360) 740-1213. DNR Stewardship Forester Julie Sackett advises a small forest landowner in southwest Washington. Photo: Ken Bevis/DNR. Washington State University (WSU) Extension will soon hire a forest stewardship educator, who will help landowners plan and execute various management activities to achieve their goals and reduce risks. Based out of the WSU Lewis County Extension office in Chehalis, this unique position will serve throughout southwest Washington, providing organized educational opportunities landowners with the purpose of significantly increasing the amount of forest land being managed sustainably under written forest stewardship plans. 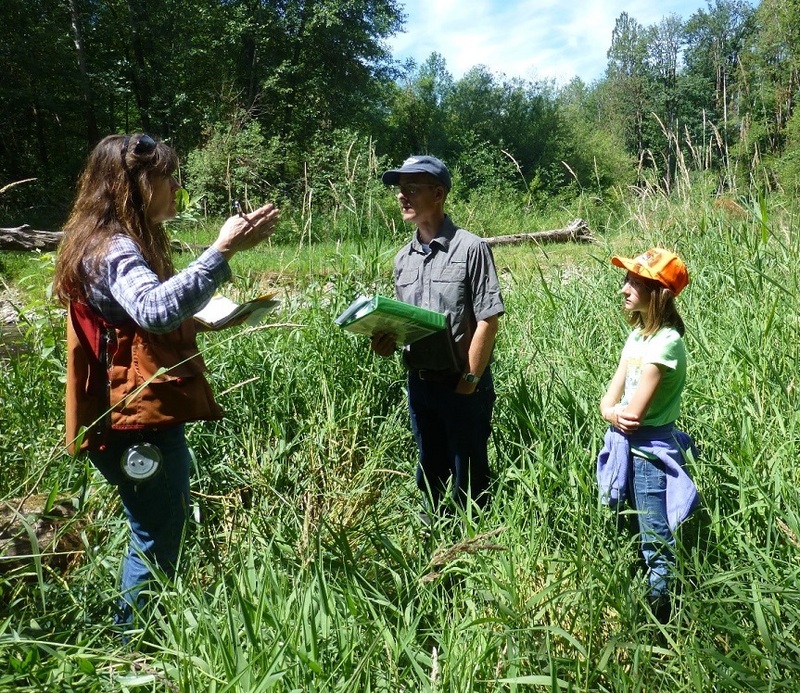 Approximately 54,000 family forest landowners own and manage 1.1 million acres in southwest Washington, making this group the largest private land user group in the region. Family forests are typically located in lower elevation watersheds, adjacent to streams and rivers and often in the rural‐urban interface. In addition to their critical contributions to public amenities and commodities (namely timber), these forestlands are essential for clean air and water, wildlife habitat and for the economic vitality of rural communities. 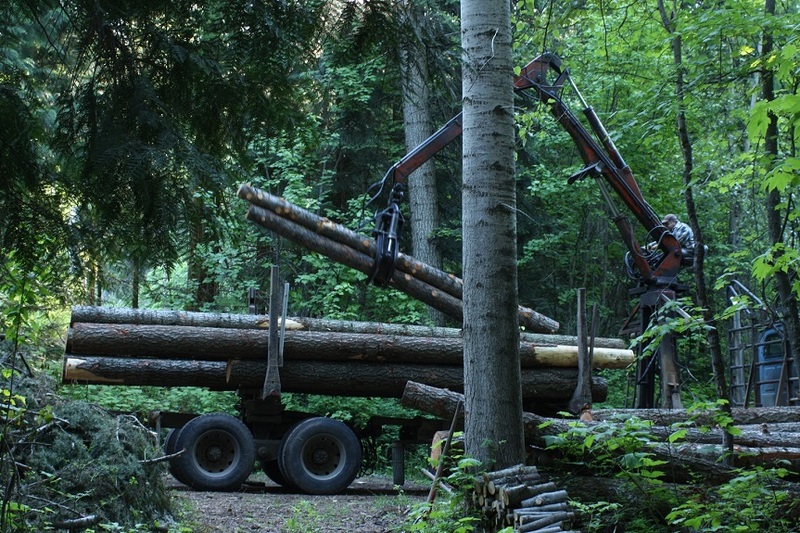 Annually in Washington state, the forest sector provides over 45,000 jobs, generates $16 billion in gross business revenue, and pays out $2 billion in wages and $100 million in tax receipts. Southwest Washington has been identified as the most critical region in Washington state for the production of timber resources and is a major contributor to salmon recovery. Load of logs from the Mack property heading to the mill. Photo: John Stuart. After five years of helping assemble Forest Stewardship Notes, this is my last newsletter before I join the happy crew of new retirees at the end of the year. Andy Perleberg asked me to write a few words of reflection for the occasion, and what could be more apt than describing the impact our forest stewardship classes have had on my own personal experience as a forest landowner. After 20 years with WSU Extension, I will truly miss the day-to-day work with colleagues from DNR and WSU. But, I’ve got to say I am ecstatic about having a lot more time to play in my own 40 acres of woods here in the northeast corner of the state. But even though we thought we knew what we were doing, having to actually write our long-term property goals down on paper precipitated a whole lot of soul-searching and discussion for us—just as I’d witnessed my class participants go through many times. The coached planning protocol encouraged us to not only clarify our somewhat nebulous goals more explicitly, but come up with some measurable ways to chart our progress towards them. 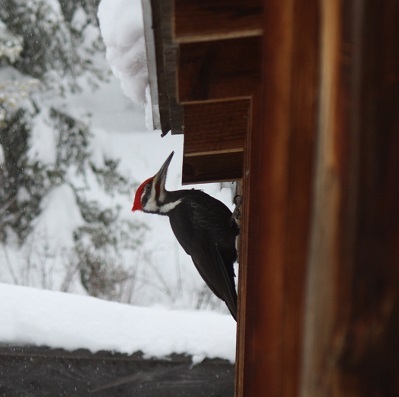 My husband is an avid birder, and especially enjoys spying on the local pileated woodpecker families in the neighborhood, an icon of northwest old growth. But as he learned more about their habitat needs, he came to realize that their presence was likely a result of being surrounded on three sides by over 600 acres of commercial timberland with abundant large trees and snags. We knew this neighboring landscape was destined to be logged in the near future. And that sparked the idea of managing a portion of our place as “core habitat” to help protect these populations over time, which became a unifying theme of our stewardship plan. John dug through a lot of research to develop specific goals to include in our plan—see his 2010 Diggings Newsletter article “Managing for Big Birds on a Small Acreage” for the details. The beauty of Coached Stewardship Planning is that the emphasis on developing a plan specific to your own particular goals means that every plan is different. While we are using woodpecker habitat needs to determine where we cut firewood, place trails, log, plant trees, etc., we have friends whose plans center around providing cabins throughout the property for a religious order retreat center; others who manage primarily for harvesting medicinals and non-timber projects; and still others who are devoting much of their acreage for timber harvest timed to fund grandchildren’s college expenses. Like us, many of them have plans with goals that may extend beyond their own lifetimes. And that brings us to the second forestry class offering that I highly recommend from our own personal experience—the “Ties to the Land” estate planning course. These sessions opened our eyes to how many obstacles the absence of a plan presents to kids who want to take over land ownership after their parents die. So we had the requisite family discussions and ended up converting our property to an LLC (one of many options discussed in the class) with our son and daughter as shareholders. Who knows what the future holds for any of us, but at least if the kids decide to hang on to the property after we’re gone, it will be a fairly straightforward process. When it isn’t raining or snowing these days, you can usually find me out in the woods working on a trail system around the property with loppers and pruning saw. While the trail improvement is ostensibly for our 3-year-old granddaughter (“Nana—I don’t like pokey trails—is this going to be a nice trail?) I’ve been thoroughly enjoying myself, and we find we are making the rounds of our property almost daily. And yes, despite the clear-cut acreage that now surrounds our land, we often spot a big woodpecker with a bright red crest along the way. Gibbs spent his entire career working in landowner assistance. After graduating from the State University of New York College of Environmental Science and Forestry, Steve started his career in 1975 as a service forester assisting landowners in Maryland. After three years there, he got the “itch” to move west. Following a short stint with the US Forest Service in Idaho, he returned to school to earn a master’s degree in forest and range management at Washington State University and subsequently worked as a forestry extension agent in Washington and Oregon. In 1989, DNR hired Steve to lead a pilot project in southwest Washington to restructure the agency’s Service Forestry Program. In 1991, he moved to DNR headquarters in Olympia to head up the newly created Forest Stewardship Program, and continued in that capacity until retirement. 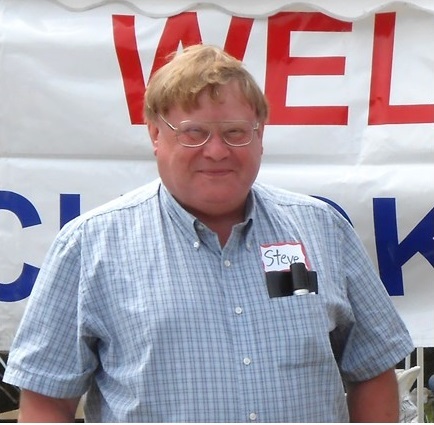 Anyone who has worked with Steve will agree that his focus on helping landowners is unmatched. For Steve, familiar phrases like “the customer is always right” and “money-back guarantee” were not platitudes but, rather, the tenets of good customer service. Steve’s caring, generous spirit and get-er-done approach have made him an invaluable resource both for family forest landowners and for those of us who work with him. We’ll miss having him on the team and wish him the best in his future endeavors. NOTE: DNR Small Forest Landowner Office Manager, Tami Miketa, has assumed leadership of the Forest Stewardship Program in addition her current duties. She can be reached at tamara.miketa@dnr.wa.gov or 360-902-1415.